Well, it’s been really busy here for the past couple of days, with little time to catch up on the blog. However, one more official day (Sunday) of the Perry Lollapalooza is still to come, and more posts are in waiting and still to materialize. This is a short post on an important milestone in the Perry II saga. Philip and I noticed on the webcam last night (Friday) that the lights in the greenhouse were not on. In addition, it appeared, from ambient lighting from the hall lights, that Perry had, at last, fully opened. This was at about 10:15. 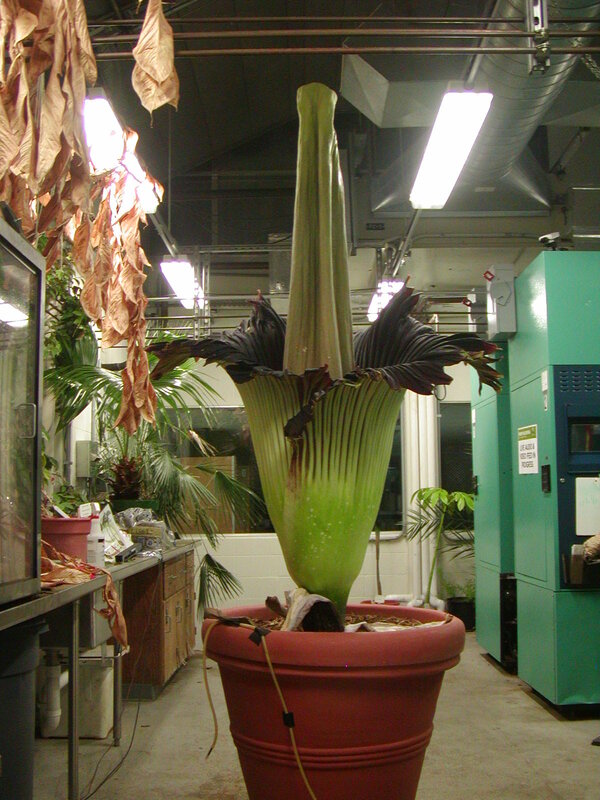 That makes the opening period of the inflorescence roughly 24 hours this time, as opposed to the roughly 5-6 hours that was required for Perry’s May 2007 inflorescence to open. We went over to Gustavus to take some pictures, turn on the lights, and provide a bit of Perry-centric activity for webcam watchers at this milestone in Perry’s life. We succeeded on all fronts. With regard to Perry’s appearance, he/she was magnificent, both in visual appearance and in olfactory intensity. 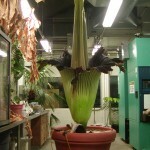 The inflorescence had indeed opened fully, with the massive, Devil’s-Tower-like spadix more visible on the western side of the inflorescence (spathe seam side). The term ‘magnificent’ is often used, but rarely appropriate. In this case, it is. Seeing the fully opened inflorescence at its peak was an intense experience, both through the extraordinary beauty of the inflorescence and the massive sculptural presence that can only be experienced by close proximity to this marvel of the Chlorophyllous Kingdom. Click the thumbnail image for a full view of Perry at her/his finest. Click here for the live streaming webcam. Perry was magnificent yesterday. He’s still putting on quite a show today. It might be fun to place a monitor that shows the time lapse of Perry’s progression somewhere near his greenhouse so that folks who come today can see all that has happened to him in the last couple of days. Bravo Brian and crew – and Perry for the great show and all the wonderful information!! Thanks much for your enthusiasm and compliments. Everyone involved with this did an outstanding job, and it has been a great and highly enjoyable success. We saw Perry yesterday mid-morning. He was glorious. Thanks for making him available to the public and for keeping us informed of his activities. We hope the lady who was ill after seeing him yesterday is doing better today. Hi Beth – Thanks for coming to see Perry, and we hope to see you back in about three years. With regard to sickness, I’m assuming that the lady recovered at a reasonable rate after leaving the Perry Room. We have yet to have anyone throw up in there, but there’s a reasonable chance that it will happen eventually, I suppose. Today is the first time my husband and I met Perry and found the experience very informative and a pleasure to learn more about a plant of such odorous character. Brian O’Brien provided an interesting presentation from which we came away with a better understanding of Perry. I later wondered if the fruit of the plant is edible. We look forward to seeing Perry again in the future. Hi Pam – I’m glad that you got to visit on the 25th, and hope that you were able to make it back today. With regard to edibility of the fruit, I don’t know. Amorphophallus konjac corms are the only part of an Amorphophallus that I’ve heard of being used for food, and those have to be processed to remove stinging crystals that they contain. That’s right; I remember you saying that during the presentation. So much information and I could not retain all of it. Thanks for the reply. Thanks for displaying Perry via the webcam. I had never heard of a “Corpse Flower” before in my 56 years of life. I have truly enjoyed learning about this plant and watching it blossum. Thanks for visiting, and it’s great to hear that it was a completely unique experience for you. We hope to have another flowering in about three years.